4.2 million gross square feet. Two Chicago city blocks. 25 stories. Once the world’s largest commercial building. 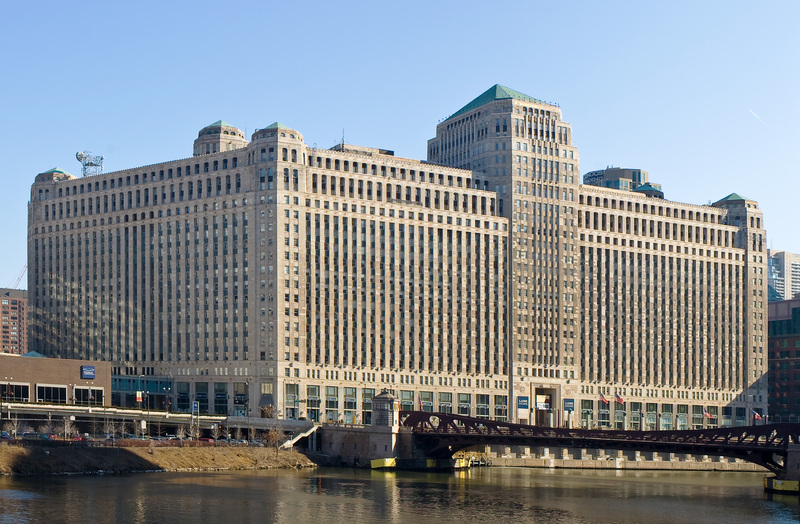 Merchandise Mart, an epicenter of Chicago business and a destination for the ETHS Investment and Business Club on a blustery Friday in December, is gargantuan. It welcomes 38,500 people each business day, and nearly 10 million people each year. 11 floors of permanent showrooms for gift, home, outdoor, and commercial furnishings beckon consumers to browse and buy. 15 major trade and consumer shows welcome thousands of potential customers. Simply stepping into the building is like entering a wonderland of business, another world of couches and faucets, sweaters and warm donuts. The queue of ETHS Investment Club members readily embarked on a grand exploration of the commercial colossal. In suits, ties, and dresses, the Investment Club made their way down a massive hallway. Minutes passed, as shops advertised cabinets, home furnishings, and sofas. Black dress shoes slid across the marble floor, and wandering eyes scanned elegant lamp fixtures, bronze platings, all the accoutrements of a luxury shopping mecca. The club members explored, visiting stores, buying food from a number of restaurants, generally enjoying the ambiance of the place. Eventually, the time came to travel to the 12th floor, and the young entrepreneurs piled into the elevator. 1871 awaited. 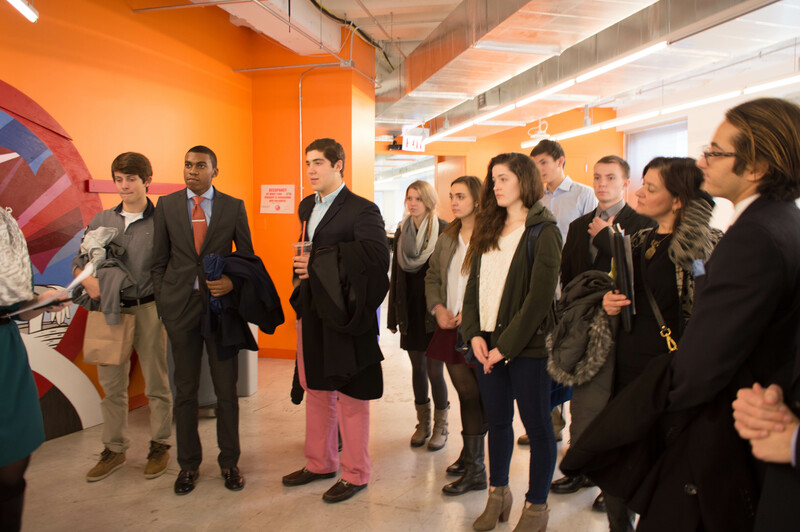 Upon arriving at the tech incubator, the Investment Club members were split into two groups. One group was led by Diana Lopez-Obaldo, the Director of External Affairs and International Relations at 1871. Ms. Lopez-Obaldo showed the ETHS group all of the nuances of the space: the panel that lit up when a tweet mentioned 1871, a wall that was covered with a quirky green moss, all of the chic meeting centers and modern offices. At one point, one of the tour groups was stopped by a walking robot-lady, a technological stand-in for an employee at 1871. The spectators oohed-and-aahed, clearly impressed by the innovative measures and creations of the area (although the robot lady was a little weird). Finally, Lopez-Obaldo showed the club members into a large room with a white table; the tour had concluded, and Tom Alexander, the Chief Operating Officer of 1871, was ready to give a talk. Mr. Alexander, with a tall, confident presence, introduced himself as having worked closely with Rahm Emanuel (in communications) before coming to 1871. He opened with an anecdote about ties; he and Rahm didn’t want to wear ties in 1871, due to the relaxed nature of the incubator, and one day the pair arrived to 1871 to see a number of people wearing ties (a young startup, full of precocious college students, had won an opportunity to work in 1871). Rahm was unsettled by the amount of ties, to say the least. Next, Mr. Alexander launched into the business aspect of 1871, describing the three purposes that the space is intended for. 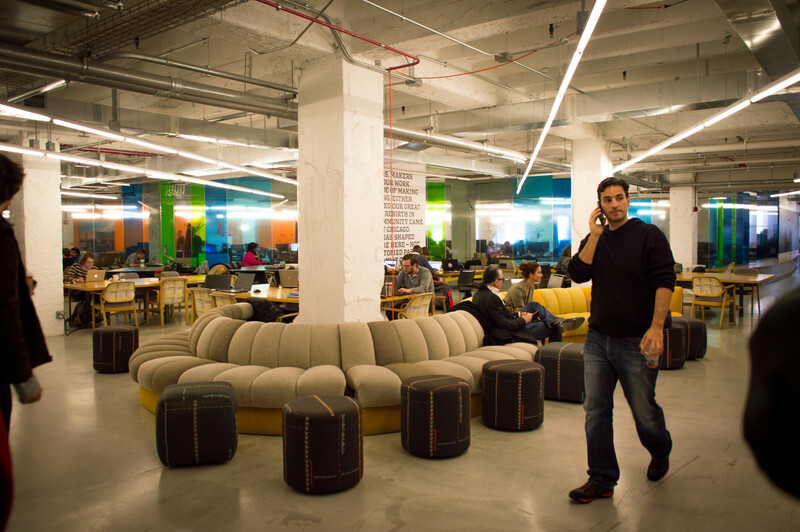 Firstly, 1871 is a place for startups. 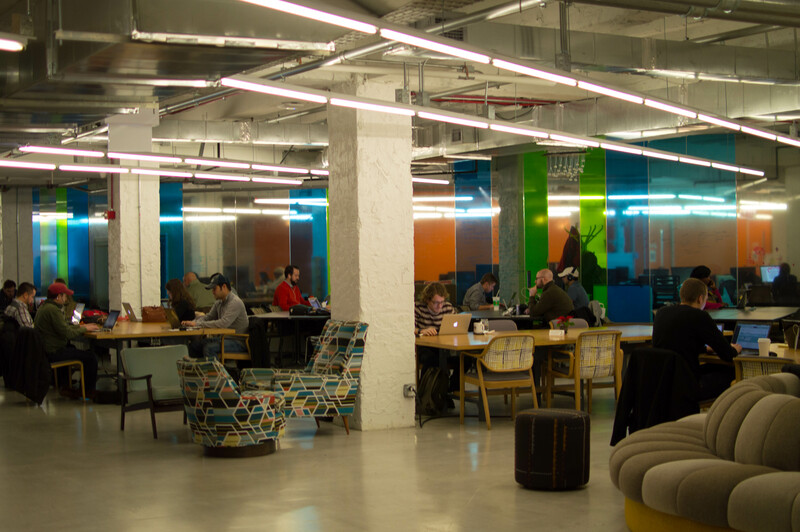 Secondly, the area was designed to deal with inbound interest, allowing venture capitalists and other interested investors to select clever, profitable companies, and for those companies to solicit the capital they need to succeed. Alexander’s third purpose, one that might be the hardest to accomplish, is finding a way to take 1871, its “special sauce”, out of the four ways; once companies graduate from 1871, they should have the resources, intelligence, and experience to forge a strong, successful path towards innovation and expansion. As someone who oversees the companies who call 1871 home, Alexander had a number of stories about successes, and failures he has witnessed. He brought up the story of the company 640 Labs, which makes sure farmers don’t miss any of their field during planting and harvesting; apparently, farmers like to tweet, and 640 Labs saves them money when they are distracted. Two other awesome companies are Spot Hero, an app that helps people find the available parking spots, and Package Zen, which streamlines the handling of packages for apartment buildings, school dorms, and large corporations. Alexander stressed the importance of a company’s name: Give Me Another, an Amazon knock-off, seemed doomed to fail before it really even began. 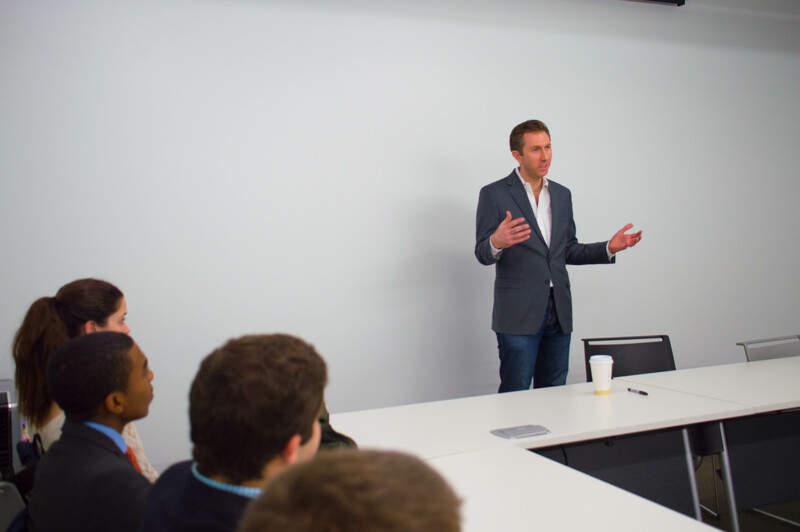 Questions began, and one budding businessman asked Alexander about Chicago’s potential to be the next Silicon Valley. Alexander replied that Silicon Valley is only a euphemism, meaning a place for talent and a beacon for venture capital. 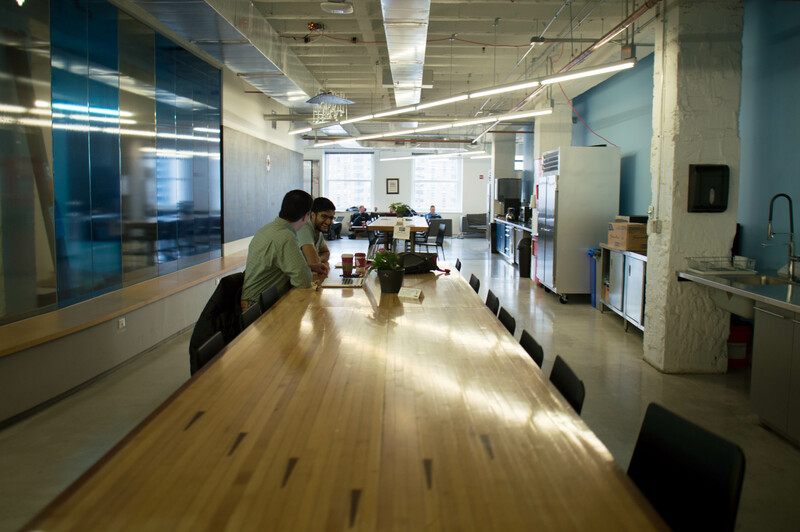 The unique Chicago community, which he feels is more open to startups, and its existing commitment to innovation, puts the city in a great place for continued success. Mr. Alexander ended the session with high praise for J.B. Pritzker, saying that he has played an enormous role in the growth of Chicago technology. With lingering commendations of the next speaker in their heads, the Investment Club filed out of 1871, out of the Merchandise Mart, and braved the Windy City weather as they headed to the Deloitte building. Special thanks to Howard Tullman the CEO of 1871 for making this happen and to Tom Alexander the COO for speaking to us. This post was written by Ben Osterlund, edited by Noah Silverman, photos by Benjamin Silverman.